Fairmont Tower's Condo Conversion: Whither Tonga? 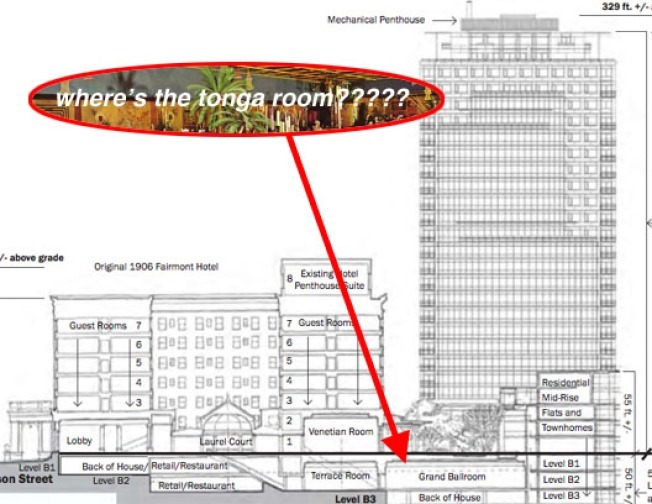 The condo-fied Fairmont Tower is still years away, but the freakout over disappeared tiki bar Tonga Room has already begun. Well, to be fair, it started with one lone cry a few weeks ago, when Curbed commenter Nathan asked, "Dear God, what about the Tonga Room?" Well, we don't know. And neither does the Fairmont Hotel's PR person. But the schematics for the new setup (condos in the Fairmont Tower, with a slightly redone podium) show no Tonga Room, and in its place, a shifted Grand Ballroom. That leaves San Francisco minus one tiki bar, and we already only have eight. The horror! Laughing Squid notes that the comment period has already passed on the project's environmental impact review, so Tonga adherents will have to find some other way to circle the wagons. Sidenote: the new tower will have a "mechanical penthouse" and no more pointy Disneyland cap.